The University of Oregon recognizes the importance of food security—that in order to be a successful student, you need to have enough to eat. To help “feed the flock,” a new pilot program offers a confidential route for students who do not have the money or meal points available to purchase food to access meals on campus. 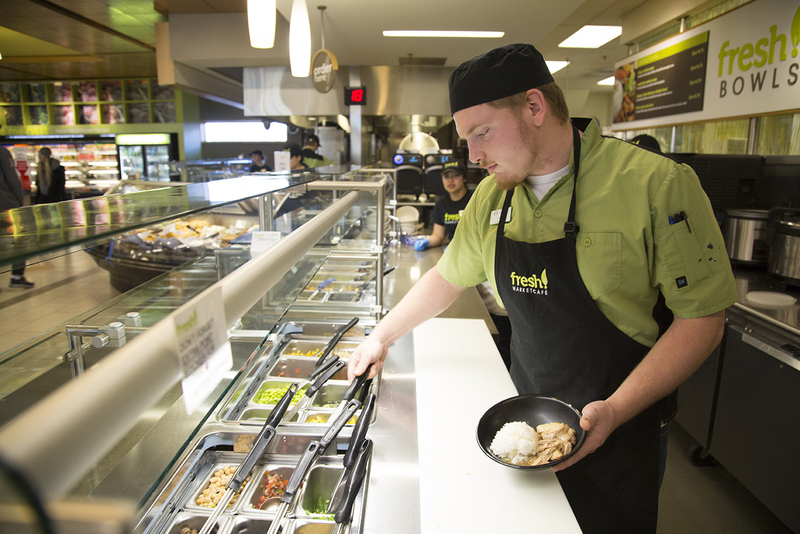 Using the Duck Bucks function of the UO ID card, the Ducks Feeding Ducks program provides a transfer of $10 into a student’s account (limit of three transfers per term) for use at any campus food venue that accepts Duck Bucks. Ducks Feeding Ducks received limited funding for this pilot year, so we will be allocating $25,000—or 2,500 meal requests—per term. We are setting an initial limit of three transfers per term, per student. Depending on program usage, we may adjust the limit. If you’d like to help UO students maintain food security, consider making a donation to Ducks Feeding Ducks. Students, UO employees, alumni, and family members can donate by using our online form. If you are out of money and in need of a meal, submit an online request by logging in with your Duck ID. If you meet all of the criteria listed below, the ID Card Services Office will transfer $10 to your UO ID within an hour, and send you a confirmation email. You’ll have two days to use those funds at a campus eatery that accepts Duck Bucks. Since you’ll be paying with a swipe of your ID card, there will be anonymity and no indication that you are using a food benefit. It is important to note that after two days any unused portion of the $10 from Ducks Feeding Ducks will be removed from your account and transferred back into the main fund. Additionally, if you receive the funds but don't use them, the transfer still counts as one of the three allowed per term. During this pilot year, Ducks Feeding Ducks will be allocating $25,000—or 2,500 meal requests—per term. We are setting an initial limit of three transfers per term, per student. If you don't meet the criteria for Ducks Feeding Ducks or have a more persistent need, there are other programs available to help you get enough food, including UO Catering's leftovers program, the Student Food Pantry near campus, and monthly Produce Drops at the EMU. If you have questions about the program or issues with the application, please contact the ID Card Services office at 541-346-3113 or email uocard@uoregon.edu. You can also refer to our frequently asked questions page.